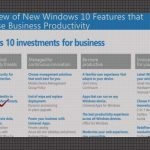 Let’s take a look at some of the new business features that Microsoft is adding that are specific to either the Professional or Enterprise versions of Microsoft Windows 10. Previously, I discussed Microsoft Hello and Microsoft Passport, as well as Windows Biometrics. You have those under some of the protection against some of the modern security threats. We also have mobile and desktop support with Universal Office and Office Desktop, Intune, Azure, and other Cloud services that are out in the market. We talked about mobile device management, and that some of that’s necessary, and it needs to be supported through a group policy, and/or Active Directory in your Enterprise Environment. There will definitely be enhancements or upgrades you’re going to have to make to Active Directory and Group Policy to support some of the new features of Windows 10. We talked about In‑Place Upgrades. Microsoft has a new model, there are not going to be anymore versions Windows 10 is it. If you take a look at some of the other operating system providers out there, whether it’s Android, Apple, or others, they’re all going to a single operating system where you’re getting full release upgrades of that that have been thoroughly tested and are fully integrated with additional functions and capabilities. If you go to Windows 10, that’s the same model that Microsoft is going to provide you. We’re talking about in‑place upgrade without those regular patches and updates that you had to test. Microsoft’s going to test that, and you’re going to move forward, full roll up by roll up. We talked about Azure and Active Directory a little bit as some of the requirements to support it. That’s Could‑based management. Cloud to base deployment of your settings, configuration settings and your management of devices. Windows As A Service is part of how Microsoft’s talking about the deployment of the software that’s out there so that they get the updates through the Cloud. You don’t have to use your own Windows Update Server, but you can if you want to. Universal Applications. 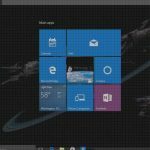 Microsoft Windows 10 supports both the Microsoft Modern Apps, those desktop icons that you got in Windows 8 and 8.1, as well as all of the support for Legacy Applications in your standard desktop apps supported under Windows 10. Microsoft Office has been upgraded. You could do Office 365 through the Cloud, or you can get new versions of Office that work across multiple Windows 10 platforms. We have Internet Explorer 11, and we have the new Edge Browser that’s natively deployed with Windows 10 as well. We’ll be demonstrating that as we go through the new interface that’s present in Windows 10. We also have support for additional kinds of devices. Remember, we said one platform across all of them. There are new devices specifically designed to support some of the Microsoft Windows 10 touchscreen and/or secure environments, including the surface Lumia and some of the hollow lens types of devices support new functionality with Windows 10. We now have the One Developer Platform, not just the one operating system platform. That means that developers can develop applications that cross all of the Windows 10 different device environments for us. Windows as a service is part of their deployment as we said, and the code from your Legacy systems will still work. If we take a look at, and this is part of what Rick Trader will go into in his Module 2 presentation, is the ability to do Enterprise Management of your Windows 10 platform. This includes Active Directory, Azure, Group Policy, System Center Configuration Manager Upgrades. We mentioned that you got third‑party not only for device management, but also for the Mobile Device Management. Different update solutions including support for some third‑party mobile device deployment solutions, whether they’re on the premise or in the Cloud, and whether you’ve got to Choose Your Own Device (CYOD) or Bring Your Own Device (BYOD) approach. The third module that you’re going to get from Mike Danseglio is going to cover more detail about some of the different security features of Windows 10, including Windows Hello and Passport, Enterprise Credential Production, which there are things like keeping your entire credential chain, the trusted authority, and any of the other credentials that are under that managed through Active Directory or other solutions, remote management with Azure, Device Guard, Windows Defender, hardware‑based isolation. Things like being able to identify the location of a missing or misplaced device and/or a remote wipe . Then some of the UFI and other Trusted Platform Module content will be discussed in far more detail. What I’m going to go into next is the navigation of Windows 10. I’ll show you some of the interfaces as we navigate through Windows 10’s desktop, but you’ll get more detail about how to implement them, and why you might or might not implement them as we go to Module 2 and Module 3 of the First Look Clinic. For more, watch the entire presentation at our Video Training Website: Windows 10 Features and Navigation.